Embark on a culinary journey to the Caribbean islands in this three-volume series, and discover the sensuous delicacies of the distant tropical paradise. A cornucopia of flavors, dazzling colors and luscious fruits awaits you. More than 100 cakes and pies are included in this fantastic collection. Full color photos are shown for each of the finished desserts in the book. Additionally, full color photos of step-by-step preparation techniques are also given. There are also ingredients and instructions given for 23 basic recipes which are utilized throughout the book. This collection of sweet temptations ranges from simple fruit pies and spiced cakes to more complex brioches and charlottes. 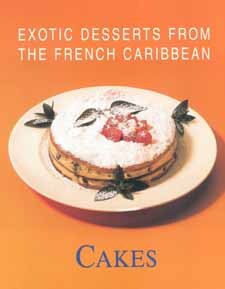 Exotic Desserts from the French Caribbean: CAKES has been translated from the original edition which is in French "D�lices des �les - Tartes, Tortes et Gâteaux".